What we say, how we say it, and what we’re doing when we say it combine to create great messages—or messages that are forgotten in the next moment. When you can “speak as well as you think,” you can drive your business results, whether you are addressing shrinkage issues with the loss prevention manager or discussing profit-enhancement strategies with corporate executives. Beyond that, the ability to communicate clearly, confidently, and comfortably is a key talent differentiator that will enhance your career and professional development. When you’re speaking to your staff, your management, or your customers, first impressions are critical and you need to know the most effective business communication strategies. 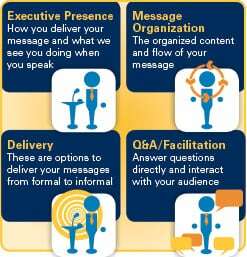 Focus on the four quadrants of communication, shown in Figure 1. Eyes—Where you are looking when you speak. Hands—What you are doing with your hands when you use them (gestures) and when they are at rest. Posture—How you stand, sit, and move. Volume—Your “speaker’s voice” for those times when you are “on” should be at the 7 to 8 level, where 1 is a whisper and 10 is a shout. Inflection—These are the peaks and valleys that the voice has. It’s how your listeners know what’s more important from what’s less important. Non-Words—The four most common non-words in American English are “umm,” “ahh,” “like,” and “you know.” You sound smarter when those words don’t land in every pause. They take away from your executive presence. Speak one thought to one person and pause between thoughts and people. Inflect your key words and phrases. Balance your stance or sit up straight. Gesture above the waist and outside your body lines with hands open. Reset or drop your hands to your sides between thoughts. The first group was shown three 10-second silent videotapes of the professor teaching the class. The second group was shown three 5-second silent videotapes of the professor teaching the class. The third group was shown three 2-second silent videotapes of the professor teaching the class. The fourth group was the students who sat through that professor’s class for the entire semester. Those who watched a silent 2-second video clip of a teacher they never met reached conclusions about the teacher that were very similar to those who attended the teacher’s class all semester. When I’m done speaking, what do I want them to know or do? Who Are Your Listeners? Consider your staff, your team, or your audience. Who are they? How many people will you speak to? What time of day will you speak? What do you know about them? In what ways might they be predisposed to you or your topic? If you’re familiar with them, and you’re there to influence them, think about how they might have influenced you previously. Do they have a storytelling culture? Do they like statistics and facts? Do they often quote key thought leaders? When you tailor your message to your listeners, you come across as customer-oriented, focused, connected, and aligned with them. The crowd enjoyed the embedded message that Coach Dungy wasn’t going to bore them with a long speech, and he made Tommy and his dad feel very special that evening. “Know this” means we want to inform, update, or educate. 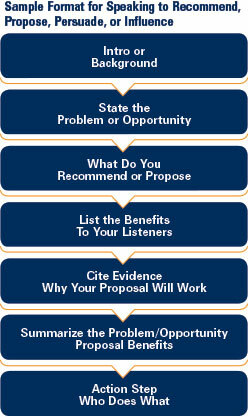 “Do this” means we want to recommend, propose, persuade, or influence. “Believe this” means we want to inspire. 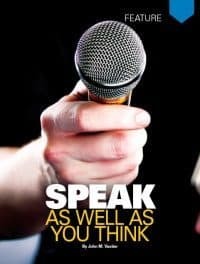 When you’ve answered the question, “What do you want your listeners to know, do, or believe?”, build your message so that when you’re done speaking, that’s where you finish. If my outcome is to have my audience “do something,” how will I influence them? S = Statistics and facts. P = Personal experience, meaning something I have experienced and can talk about passionately. E = Examples are something someone else has experienced personally. K = Killer quotes can come from authors, speakers, business leaders, and team members. Finally, there’s the demonstration. The great demonstration of our era was at the O.J. Simpson trial, when the prosecution had him try on the bloody glove. As Simpson tried to slip his hand into the glove, he was clearly heard saying, “It doesn’t fit. The glove doesn’t fit.” When a demonstration goes well, it’s compelling–and the opposite is also true, as in this case. Story Telling. Speakers in a business setting often lament, “Oh, I don’t want to tell a story. It’s a business presentation.” But stories are synonymous with case studies, examples, personal experiences, even jokes. They all follow the same B-A-R pattern. Here’s an example that illustrates the pattern. (Background) The year is 1974. The country is Bangladesh. There were 42 female bamboo stool weavers who needed money for raw materials. They were poor and had no collateral. They had been borrowing from a local moneylender at usurious interest rates. (Action) Muhammad Yunus loaned these women the equivalent of $27 US dollars. He required no collateral. His idea was simple. Given the chance, poor people could be just as creditworthy as the rich. He depended on peer pressure of the group to repay the loans. (Result) Yunus established a practice called microlending, and he founded Grameen Bank, which since 1974 has lent more than $5.7 billion to more than 6.6 million poor people around the world. Others have imitated microlending. In 2006, Yunus was awarded the Nobel Peace Prize. Anytime you tell a story, tie it back to the point you’re using it to make. Many presenters expect their listeners to make the connection. Make it for them. Use words such as, “Now, the reason I tell you this story is to…” and reaffirm your point. Transitions. Transitions are how one part of the message hangs together with the next part of the message. When we use appropriate transitions as part of our business communication strategies, listeners describe the message as organized, flowing well, hanging together, making sense, and logical. Make this approach work for you. Find a format. You need a “know this” format and a “do this” format. Figure 2 is a sample “do this” format. However you develop your own format, make it your own, and the majority of messages you deliver during your career will be accomplished far more easily than if every presentation is a unique-unto-itself message. When you deliver, you marry your physical skills with your message. When it matters most, get up on your feet. If you’re only presenting to two or three clients, it’s overkill to stand to deliver your entire message. But do look for an opportunity to get up on your feet. When you are on your feet, you take an ordinary presentation and make it an event. Every message can be delivered by speaking one thought to one person. It will work best if you organize your message in bullets, thoughts, or packages. Don’t write your message out in script or longhand. It makes it too hard to deliver. Speak or deliver thought to thought rather than word to word. The three main adult learning styles are auditory, visual, and kinesthetic. Business communication strategies play into these learning styles. When you tell your audience something (auditory), show them a PowerPoint presentation and/or give them a handout (visual), and have them interact with that handout (kinesthetic), they will retain that information much longer. For example, when you deliver from PowerPoint or handouts, follow the approach that great sports announcers, such as Al Michaels and John Madden, use. Michaels always speaks as he calls the play, meaning he tells you what you see. Then, after the play is run, Madden steps in and adds the color by telling you what it means. As a presenter, you need to know that the audience will look first and listen second. This means that if you’re delivering with visuals or presenting from a handout, you need to tell your listeners first what they see, then what it means. It’s critical that the spoken message and the visual message be identical. So often we hear the presenter adding color first while listeners are looking at the pitch book to find some visual cue of what the presenter is saying. The rule of thumb is to write what you’re going to say, then stay very close to what you’ve written. You work hard to organize a logical, compelling presentation and it’s absolutely sensational, but the audience hammers you during the question-and-answer period…and that’s all anybody remembers. Always “meet the listener where the listener is.” This means, if the listener wants to ask a question in the middle of your presentation, take it when it’s asked. What’s important to the listener is what should be most important to you. To take the negatives out if it’s a hostile question. To position the issue in preparation for your answer. To buy thinking time before answering. So how do I communicate these messages most effectively? Whether you’re having a cup of coffee with your boss or speaking to a roomful of your store management team, your executive leadership team, or a group of people you’ve never met, the way you communicate is critical to accomplishing your objectives. For the best results, follow the four quadrants of communication. Do your homework and organize your message. Then deliver it to one person at a time. Don’t forget to use your voice, gestures, and posture to physically project confidence and enthusiasm. Practice these techniques for just six weeks to make them your own. You—and your listeners—will notice a big improvement. This post was originally published in 2013 and was updated March 1, 2018.